Different plates are available for general concrete grinding, adhesive removal, re-profiling of concrete floors, coating removal and polishing of marble, terrazzo and stone. All SPE Diamond Plates are uniquely machined to provide accurate diamond segment location. This process guarantees precise balance ensuring high production rates, long life and eliminates uneven wear. Non standard compounds and grit sizes are available to order for special applications. 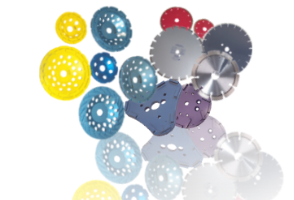 SPE Diamond Plates are available to fit most popular floor grinding machines.